Protein Chocolate | Totally yummy. But 90% less sugar. Totally yummy. But 90% less sugar. Your life is stressful enough. So reward yourself with something that's actually good for you. Dark. Creamy. Totally tasty. But with 90% less sugar. * Our protein chocolate. So much protein, so little sugar. The sweet reward for you and your muscles. Whether you’re working hard at the gym or chilling on the couch. A 6 pack of your favorite flavor. Your 3 favorite flavors in 1 package. No added sugar here. See for yourself. If you’re gonna eat chocolate, make it Protein Chocolate. Ingredients: cocoa mass, whey protein concentrate (milk) (28%), cocoa butter, sweetener (maltitol), cocoa nibs (1,5%), sea salt (1%), emulsifier (sunflower lecithin), natural vanilla aroma "
Dark chocolate with whey protein, cocoa nibs and sea salt. With sweetener (maltitol). Cocoa solids: 58% minimum. Excessive consumption may induce laxative effects. Despite careful monitoring this product may contain hard pieces of fruits, nuts, etc. May contain traces of gluten and other nuts. Ingredients: cocoa mass, whey protein concentrate (milk) (28%), cocoa butter, sweetener (maltitol), hazelnut pieces (5%), white quinoa puffed (1%), emulsifier (sunflower lecithin), natural aromas (vanilla, hazelnut). Cocoa mass, whey protein concentrate (milk) (28%), cocoa butter, sweetener (maltitol), emulsifier (sunflower lecithin), natural vanilla flavour. Dark chocolate with whey protein. With sweetener (maltitol). Cocoa solids: 58% minimum. Excessive consumption may induce laxative effects. Despite careful monitoring this product may contain hard pieces of fruits, nuts, etc. May contain traces of wheat. When can I eat your Protein Chocolate? Whenever you want! Your new favorite snack is perfect as a sweet reward after your workout. Or whenever you just really need chocolate. Why does your Protein Chocolate still have fat in it? How did you figure out how to make chocolate without any sugar in it? Can I bake with your Protein Chocolate? Of course! You can use our Protein Chocolate for anything you'd use normal chocolate for. Just try it! 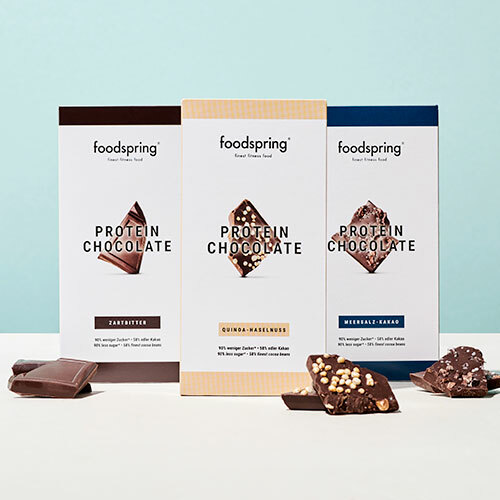 Because our chocolate has more protein, you'll have to adjust the other ingredients in your recipe a bit to make sure your results are just as delicious as you remember. Protein Chocolate 6er Paket Mix will be back in stock shortly.